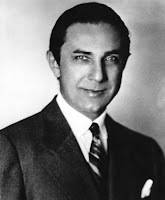 Legendary actor Bela Lugosi (click here), was born today (October 20th, 1882) in Lugos, Austria-Hungary (now Lugoj, Romania.) Best known for his role as Dracula, Bela can be seen in 107 films. Lugosi died of a heart attack on August 16, 1956 while lying in bed in his Los Angeles home. He was 73. Click here to visit the site maintained by his family...great reading! Dracula is by far my favorite movie monster and Bela's Dracula sets the bar that all movie Dracula's (and vampires) are measured up to.